Metal Knife with Plastic Inlay in Handle. Minimum Quantity: 100. As per the statics suggested by PPAI; Promotional Products Association International Studies 94% of the people who participated in the survey could recall the promotional products that they had used along with the brand name imprinted on it. The consumer has a greater tendency to make a purchase after using a promotional product than the other forms of marketing tactics. 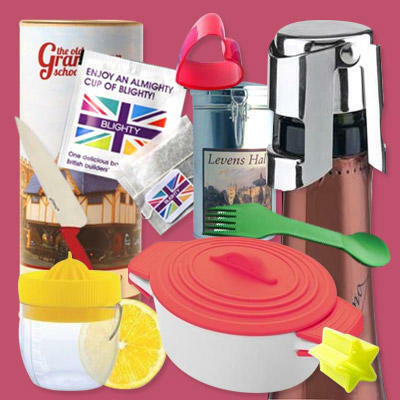 Our home and kitchen items will help you to reach a wide range of the audience. We have different categories of knives available in unique designs and amicable colors along with the serving trays, peelers, cutters, bowls, bottles, baskets and tubs. The kitchen products have an exhaustive reach and interactivity with the audience. No matter what kind of business you are involved in these products are accepted by one and all. Our unique designs and custom made logos will lead to proliferation of your brand.